BAIKANTAPUR, Bangladesh, Oct 4 2012 (IPS) - With the rains over Gopalganj district intensifying each year and much of Baikantapur village permanently waterlogged, Bijoy Kumar Sen had little choice but to abandon traditional rice farming and grow vegetables on bairas – floating islands built of straw and aquatic plants. He and his brother Dhiren Chandra Sen, both in their early fifties, are glad that they made the choice. They now take baskets of beans, radish, carrot, bottle gourd, spinach and spices like ginger, garlic and turmeric to the weekly haat (market). The Sens are grateful that the bairas are more productive and bring in better incomes as compared to their long submerged rice paddies. Due to frequent flooding over the last 50 years, the farms of Baikantapur, about 170 km from the capital of Dhaka, have turned into a wetland. For the residents – mostly from the Hindu minority community – rice cultivation is now only a memory. About 50 years ago, Sen said, one could drive or walk through Baikantapur, but not any more. Today, the roads and the entire lowland areas of about 40 sq km remain submerged round the year due to water logging. But, instead of cursing the havoc created by changing climate, the local inhabitants have made the best of a bad situation by farming on floating bairas. The Bangladesh Centre for Advanced Studies (BCAS), a non-government organisation, has played a major role in encouraging the switch to cultivation on bairas – essentially soilless agriculture that is similar to advanced hydroponic farming. Decomposed water hyacinths and aquatic weeds are used to make the bairas, large rectangles of floating vegetation with just enough organic matter for the plants to put down roots and flourish. There is little maintenance needed. Bairas need no fertiliser as the water and compost provide all the necessary nutrients. Since there is no soil, plant diseases and weeds are rare. “We prepare bairas before the onset of every season. Before winter it is some types of spices and before spring it is good to plant certain vegetables,” said Minati Sen who helps her husband plant the seedlings. Most of the vegetables and spices grown on the bairas are sold in the local market at prices cheaper than those grown by traditional methods, because farmers save on costly fertilisers and pesticides. Baikantapur is home to some 900 Hindu families who depend on the bairas for a living. Most of them move around on small boats and live in huts built on tiny islets in what can be described as an amphibian existence. Haseeb Md. Irfanullah, general secretary, Bangladesh Association of Plant Taxonomists, told IPS: “The floating gardens came as a blessing for the Baikantapur inhabitants – all that was needed was a willingness to adapt. “Bairas have actually been around for centuries. What we are doing is sharing knowledge and facilitating an idea that is appropriate to the ecosystem and encouraging adaptation behaviour among the local people so they can cope better with flooding and salinity,” Rahman said. Densely populated Bangladesh has always been vulnerable to natural disasters, but a steady increase in the intensity and frequency of adverse weather events has turned Bangladesh into one of the countries worst affected by climate change. Seawater intrusion in the past two decades has already caused damage to an estimated 150,000 hectares of arable land, while river erosion has led to the loss of another 120,000 hectares, reducing the total land available for farming to Bangladesh’s 150 million people. 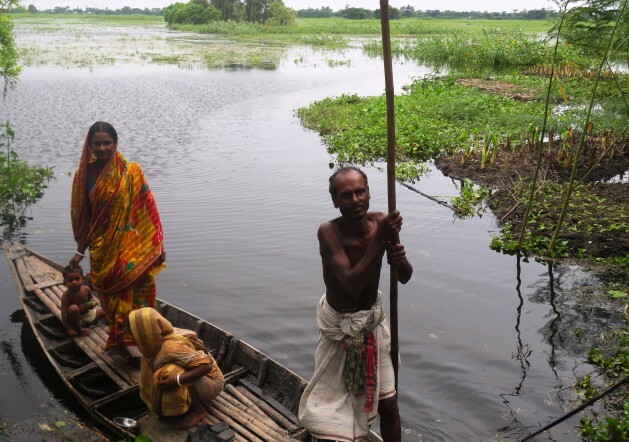 Flooding, cyclones and saline water ingress have already forced tens of thousands of Bangladeshi farmers to change cropping patterns or abandon farming altogether to become ‘climate refugees’. Agricultural scientists predict that crop yield will decrease by at least 30 percent by 2100. Production of rice and wheat, staples in Bangladesh, will reduce by an estimated 8.8 percent and 32 percent respectively by 2050, according to the agriculture ministry.